W Fischer & Sons consulted with MidntieHour to implement an online system and process to migrate their established business online, to offer existing clients an easy to use showcase of their products with the ability to purchase from the website and help to generate new business. The public site details the company with information pages about the product design and concept with a gallery to showcase the products. The overall look and feel of the site design is clean and uncluttered focussing on the range of products, the colours are neutral to enhance the full colour photo images of the fashion accessories. MidniteHour were required to create a database for the products sorted into categories, each product has unique options and variants. MidniteHour applied addition scripting to create the functionality to achieve the correct feel for the site. An easy to use interface allows the customers to browse and add items to their shopping cart, the cart is configured for their customer type who will usually order more than one colour or option for a product, each with product variants. Customized scripting guides the user through their shopping experience. Multiple images can be used for each product to show items in their colours or a product can display the various seasonal colour cards and individual colours that the customer can choose to purchase. All of the items, colour cards, individual colour swatches and options were created to work with the site design and structure. MidniteHour also implemented an inventory system to calculate inventory from each of the product options relevant to a product type. The company is aware of market saturation and competition, to combat this the product catalogue is hidden from unauthorised members. Companies requesting membership will be verified and their business and location known to W Fischer and Sons, protecting their long term relationships. The members of the site are assigned levels of membership, each level offering a discount on their order total. Depending on their yearly spend they can be encouraged to move into a higher level to receive further discounts. The system alerts the company when a new registration or when a customer places an order. New registrations need to be verified as a retail or wholesale customer. Once their permission is granted, the member is able to browse and order from the site. The system tracks all the customer information and order history as well as the website sales that can be downloaded from the site to be used for offline analysis. W Fischer and Sons are able to direct customers to the website to help with sales enquiries and ordering, saving time taking telephone orders. The catalogue is being constantly updated with new season designs and colours. 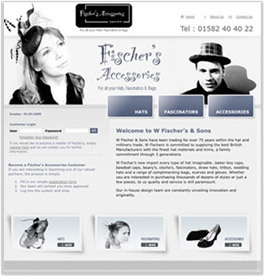 W Fischer and Sons will use the website to communicate easily with their customers. A SEO program is in place to help expose the company worldwide and generate new business interests.